On New Year’s Day I was looking for something to play which would do two jobs. One, it would appropriately mark the end of the festive season and the return of hum-drum, secondly it would make me feel slightly younger while I dealt with the reality of another birthday clocking up. Having picked this out the pile I instantly felt it was deserving a spin at DRC. In 1985 I was deeply cynical about the furore surrounding this band and the fawning of the music press just added to my caution. I was happy with my ‘jangle-pop’ world at the time and didn’t see the need to venture outside of it. It was possibly up to a year after release that I finally picked up this album. First listen on a fairly ropey hi-fi led me to wonder whether it was meant to sound like this or whether I had purchased a dodgy copy. With time I learnt to turn it up to ‘11’ and just lose yourself in the sonic mayhem that thinly hides some great pop tunes underneath. At the time I had heard bands like the Cocteau’s using over-driven and distorted guitars with echoing percussion, but nothing compare to what I found on this album. We talked on the night about albums that would worry you if you heard them being played in your child’s bedroom. Well unless you know it, I would venture that this is probably as disturbing a listen for bystanders as it was 27 years ago. I can’t help feeling that the psy-ops music assault on General Noriega would have been over in a lot less than 10 days if this had been on a constant loop (the full list of requests for the playlist remains an interesting combination http://www.gwu.edu/~nsarchiv/nsa/DOCUMENT/950206.htm). Had I been more familiar with the Spector ‘wall of sound’ and the Velvet Underground in 1985 I might not have been quite so impressed but I’m still humming (or at least my ears are) to the sound of ‘Just like Honey’, ‘Never Understand’ and the ‘Hardest Walk’ all these years later. I began my introduction by saying I was unsure as how important an album this was. I have read much to say it was, but I never really engaged with the legacy as I was hooked on the originators for at least 3 albums or so. I’ve seen Star Wars, but I’ve never listened to My Bloody Valentine properly! 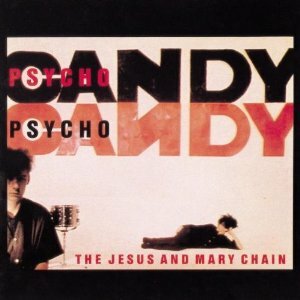 Rob listened: ‘Psychocandy’ is absolutely one of the most formative albums of my music-loving life. It taught me that you sometimes had to stick around and dig a little to get to the real beauty in a song. It also taught me that said beauty might not necessarily be a sweet vocal melody or an epic guitar solo but may in fact be the sound of a guitar being made to imitate the slicing of sheet metal. ‘Never Understand’ and its predecessor single ‘Upside Down’ were always my favourite Mary Chain tracks and, looking back, they seem to be the ones which most perfectly blended driving pop songs with absolutely furious noise. It was great to hear the album again after many, many years and particularly to realise just how caustic those guitars still are. many have followed but I’m not sure any have ever delivered barbed wire kisses quite like the Reid brothers. Tom Listened: Like Graham and Rob, my admiration for Psychocandy is nostalgic…but like Nick, I too find it hard to get through that wall of noise thing these days. Funnily enough I only became aware of the Phil Spector ‘wall of noise’ having first heard Psychocandy and so got a bit of a shock when Be My Baby didn’t turn out to have a screeching, trebbly wall of wailing guitars lacerating its sweet melody! Because, there’s no denying it, sonically Psychocandy is an open wound of an album, probably the rawest album ever made (?) and so it feels exciting and dangerous and cool despite, or perhaps because of, the pain. I still vividly remember hours spent trudging the streets of Sheffield accompanied by the Reid brothers’ cacophony thinking how cool I was to be listening to this on my tinny old Sony Walkman. Hearing this at record club for the first time in a long while, it does sound terribly amateurish, perhaps one of the progenitors of the 90s lo-fi scene; the melodies are as sweet as ever but these days my ears are perhaps a little too old for the sonic assault that is Psychocandy. That said, I recall it taking a while to adjust to the onslaught first time around so maybe I’ll give it a few more listens to see whether it will re-reveal itself in all its former glory.